The Food Chain campaign has taken a massive step forward with the introduction of a new meat and dairy Bill in Parliament. Robert Flello, Labour MP for Stoke-on-Trent South, was the second name pulled out of the hat in the annual Private Members’ Ballot on 10 June. Being selected so near the top of the ballot means he has a real chance of getting his Bill passed into law. The Bill – based on the Sustainable Livestock Bill – will aim to reduce British meat and dairy factory farms’ dependence on animal feed grown in South America. Wildlife and rainforests are destroyed so that these feeds – such as soy – can be grown. This destruction also accelerates climate change. The proposed new law commits the Government to action to limit the wildlife and rainforest destruction caused by animal feeds. It will also help UK farmers to thrive and ensure they are not squeezed by big business farming. I was shocked to find out just how much a Sunday roast can cost our planet under the factory farming system. I am determined to put this right by working with Friends of the Earth and other MPs across the House to lead the drive for planet-friendly farming that doesn’t destroy wildlife, rainforests and our climate. I hope the people of Stoke-on-Trent will join me in fixing the food chain once and for all. More than 30,000 people have contacted their MP to demand a fix to the broken food chain. And this widespread support is reflected in Parliament where more than 160 of current MPs have backed the campaign. For the last few weeks Mr Flello’s constituents and those of all the MPs in the Ballot have been urging their MP to take up this Bill. With such momentum behind it, this groundbreaking new Bill stands a great chance of becoming law and forcing real action to change the deal behind your meal. Do you want a healthy planet and thriving, planet-friendly farming? If you do the Food Chain Campaign is for you. · What’s the campaign about? · How do we fix the food chain? · What can I do today? So why are we campaigning to fix the food chain? Factory farming demands massive amounts of soy – a key ingredient in animal feed. Most of this comes from huge soy plantations in Latin America. · the loss of valuable wildlife habitat. You can find more detailed information in our report What’s feeding our Food? (PDF† 2.2MB) – or from our resource pages. And you can learn more about our other work to protect life on Earth on our Natural Resources pages. How do we fix the food chain? The Food Chain Campaign isn’t about getting rid of meat and dairy farming – it’s about getting government to revolutionise it. We want to see them change the deal behind our meals. · Take our latest action – you’re just a few clicks away from helping fix the food chain. · Get our action updates – our monthly Real Food email will tell you all about new chances to take action. · Get campaigning – find out how to get even more involved. You could also join your nearest local group. 3) If you want to follow some of the news from the G20, the lead progressive news website in Canada is rabble (http://rabble.ca/issues/g8-g20), and the main newspaper in Toronto is the Toronto Star (http://www.thestar.com/topic/torontog20summit). Wouldn’t it be nice if our government admitted that unemployment is rising and it isn’t the time for more cuts? And wouldn’t it be nice if, after all their talk about fairness, the details of every cut was made public with details of who would feel the most pain? Why are the poorest areas being hit the most? The more they bleed our economy, the sicker Britain becomes. We don’t need lip serve to fair treatment, we need fair treatment. This crisis was caused by the finance sector and is now being blamed on midwives, teachers and social workers. It’s laughable that Nick Clegg should talk about kids’ happiness when the free swimming for kids and 10,000 university places will go. Another 750,000 people joining the already unemployed can never do the country any good. Why not scrap Trident instead? Now is the time to invest in a green infrastructure — providing jobs, not unemployment. Such a pity that Caroline Lucas MP, the Green Party leader, wasn’t invited to join the coalition building discussions where she would have voted against job cuts to public services. Such a pity that we now have two look, talk and dress alikes running our fragile country. Northants needs jobs, not cuts and job losses. “In spite of the Chancellor’s protestations, this budget was neither unavoidable nor fair. Instead it was a massively failed opportunity to shift the economy onto a fairer, greener pathway. “Devastating public spending cuts of the sort announced today are not ‘unavoidable.’ They are not an economic inevitability – they are an ideological choice. · Doing so as fast as will probably send the economy back into recession with increasing unemployment. 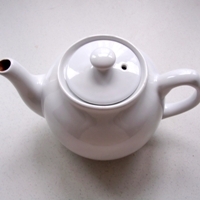 · There is no evidence that our level of borrowing could not be brought down more slowly, so there’s no need to panic. · We are missing the urgent opportunity to invest in the Green New Deal, an investment package that could create a million UK jobs and training places. · Cutting public services rather than increasing taxes on the more wealthy hurts the poor and vulnerable. · There are plenty of ways of taxing the wealthy more, not least by cracking down on tax evasion and avoidance (see http://www.greenparty.org.uk/news/2010-06-19-callous-cuts-report.html). 2. Notes on some of the detailed budget measures are below. Apart from NHS and aid, cut Departmental budgets by 25% over 4 years. These are massive unnecessary cuts. Front line services like education will be affected. It is a political choice to reduce the size of public services this way, not an economic necessity. A huge hike in the cost of almost everything we buy, which hits the poor hardest. An alternative that would raise about the same amount of money would be proper taxation of aviation. Cut £11bn from welfare budgets by 2014, starting with a freeze on Child Benefits, reductions in higher Housing Benefit payments and medical testing for Disability Living Allowance. Major worry is what has not been announced here – it must reduce the income of some of the poorest and most vulnerable. Child Benefit cut amounts effectively to a real cut of 6% over three years. This will be cut from the poorest families as well as the richest. Freeze Council Tax for one year. Will force councils to cut local services. We’d prefer a reform of Council Tax which would make bigger houses pay more and smaller houses less, with a new band for very big houses. Income tax allowance raised £1000 to £7475. Will help low paid, but will help those on middle incomes more. Would have been better to re-introduce the 10p tax band for those on the lowest incomes. 2-year freeze on public sector pay, with those under £21,000 getting a flat £250 extra each year. Even the low paid will be getting a real pay cut – £250 is a 1.2% pay increase when inflation is expected to be 1.6-2%. Public sector workers are not to blame, so why pick on them? Capital gains tax rates to be moved closer to income tax rates. In the right direction but not enough. There will still be incentives to avoid tax by re-classifying income as capital gains. Welcome, but no detail in the speech and almost certainly too small and not equal to the urgent task of tackling climate change. Pensions-earnings link to be restored from April 2011. Welcome, but Tories removed it in the first place with the result that pensions are now at a derisory level. We’d take all pensioners out of poverty with a Citizen’s Pension of £170 pw. £150 in child element of Child Tax Credit. Welcome, but partly canceled out by effective real reduction in Child Benefit. Levy on bank balance sheets. Welcome, but would have preferred a Robin Hood Tax on all transactions between financial institutions, which would raise more money and discourage speculation. The report, written jointly with tax expert Richard Murphy and Colin Hines of Finance for the Future, condemns the government “for failing to put to the electorate the option of fair tax instead of cuts,” and accuses ministers of increasing the likelihood of a double-dip recession. “The UK is currently one of the most unequal societies in Europe. But the financial crisis offers us an opportunity to rebalance the tax system. We could do it, for example, by applying the 50% tax rate to incomes above £100,000, abolishing the upper limit for national insurance contributions, raising capital gains tax to the recipient’s highest income tax rate, and helping lower earners by reintroducing the 10% tax band. “Whilst these appalling losses to the nation’s coffers are occurring, HM Revenue & Customs are pursuing a programme of job cuts which will ultimately reduce their own staff by 20,000 – close to one quarter of the total. This makes absolutely no sense. This programme should be reversed, staff re-employed, and local tax offices re-opened in order to tackle tax abuse. It has been calculated that at least £15 billion of extra tax could be collected each year as a result. That could prevent a massive range of cuts”. Jonathan Hornett, is standing in the Earls Barton By-election against Conservative, Lib Dem, and Labour candidates. The seat was held by Lucy Payne, an independent and the other two seats in the ward are held by a Tory and a Labour Councillor. Free Insulation – We’re proposing free insulation for every home that needs it. Carbon emissions from homes were a staggering 21% of total emissions in the UK in 2005 and this programme alone can cut that by 25%. We’ve done the sums, looked at the timescale and we know it can be achieved within five years. A Living Wage – The minimum wage is really a poverty wage. Every calculation shows that a real Living Wage – what we really need to provide for ourselves and our families – is at least a pound an hour higher. Greens have won a Living Wage for workers around the country, and now we want more people to benefit. Free School Meals – At a time when the health of our children is cause for mounting concern, we want our kids to know what good food is and at least once a day, sit down to a proper balanced meal. So the Green Party would provide a free lunch in all state schools in England and Wales every school day, to every pupil. Affordable Homes – The single biggest financial hurdle for many of us in this country is the cost of getting a roof over our heads. Quickly followed by keeping it there. The Green Party will use tough planning rules to make sure developers include truly affordable housing – for rent not just one-off sales – in all new developments. Safer Streets – More than half the people unlucky enough to be hit by a car doing a seemingly harmless 35mph, die. We happen to think that people on foot and on bicycles have just as much right to feel safe on the streets where they live as car users, so we’ll introduce a 20 mph limit in residential urban areas, including villages. Green Energy For All – Solar water heaters will typically save you £40 a year. And the average solar electricity installation can save up to £200 on your annual electricity bill. Never mind the CO2 you’ll save which is likely to be well over 1 tonne. That’s why we want to give as many people the chance to make their own renewable energy. About Jonathan Hornett – He’s 36, and has lived in Wellingborough for 7 years. He is married and has 2 children, 1 of whom goes to the Hardwick schools, where he is a parent governor. He work as a retail manager and he also runs a Whist Drive. His first priority, if elected, would be improving our local environment. He will help and support all local people, groups, community residents associations and Police in making Earls Barton and Northamptonshire safer, cleaner and greener. Make a difference to Earls Barton – Vote Green! Confirmed date for the Kings Cliffe Landfill site appeal is October 26 and it will start at 10am. Venue to be confirmed. Everyone who wants to speak has to be there on the first morning, and the inspector will then draw up a running order. Spread the word to all supporters and clear your diaries! Will keep you posted on the venue and any further information. See www.kingscliffewastewatchers.co.uk for more information. The view from the Essex coastline is set to change over the next year, as 48 wind turbines are erected on the Gunfleet Sands. We join the crew of the ‘Cacheflow’ whose job it is to look after the local marine life to find out more. 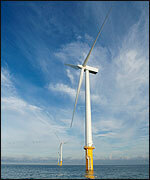 Love them or loathe them, off-shore wind farms are becoming an increasingly common site around the British coastline. One of the latest of those is being built on Gunfleet Sands, approximately 4½ miles off the Clacton coastline, or 45 minutes by boat from Brightlingsea. 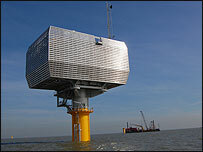 When completed in 2010, the wind-farm will comprise 48 turbines and one off-shore substation. The turbines will be roughly 900 metres apart and from sea level to the tip of the highest blade will stand 129 metres high. The site will cover 17.5 square kilometres of seabed and should generate enough electricity for 120,000 houses. The turbines will feed into the substation, which exports the electricity back to shore via a massive underground cable that runs in-land to Holland-on-Sea and meets up with the National Grid at Cooks Green. The site is being built and will be run for its 25-year life-span by Danish company, DONG Energy. Peter Sills, from the company, says locations such as Gunfleet Sands are ideal for utilising wind power. “Being offshore allows us to have large turbines, at a greater distance, with less visual impact and less annoyance to everyone concerned,” he says. “It’s on good construction ground; it’s a sandbank so commercial vessels stay well clear of it, so from a safety point of view, the positioning of the wind farm is good. At the moment, there is an exclusion zone around the site, but once construction is completed, it will be open for boats to sail around them, fish, or just look at the imposing structures. There are many people who are against either wind farms for aesthetic or environmental reasons. There are also those who say it is not the most effective way of producing energy. However, Peter argues this is increasingly not the case: “Renewable energy is definitely energy for the future. The wind farm is now a mature form of energy, it’s something that can be easily financed and be produced. “Other forms of energy, such as tidal and wave energy are to some degree in their infancy. In five or 10 years time when they’ve been developed they will be bankable projects and then they will be built. So far, much of the construction work has focused on installing the 48 monopiles, the bases which the turbines are fixed to, deep into the seabed. Hammering these 400 tonne structures into place has been done by huge ‘jack-up barges’. With these in place, the turbines can now be bolted into place and assembled over the next few months. As well as DONG’s own machinery and workforce, the Gunfleet Sands project is also utilising around 40 launches to assist in the construction work. One of those is vessels in owned by Terry Batt, whose 40-foot boat ‘Cacheflow’ is usually used as a fishing charter vessel, but for now is being used to check for marine life around the wind-farm. He says whilst it’s like nothing he has done before, it has come along at a difficult time for fisherman and boat owners like him. “It’s totally different and very, very interesting and nice to know that the environment is being well and truly looked after,” he explains. Joining him on-board are marine mammal observers Mark Parry and Tom Gordon, whose job it is to monitor the presence of animals such as bottle-nosed dolphins, harbour porpoises and common seals. “[We’re here to] make sure they’re not harmed by any of the excess noise that the piling operations would produce,” explains marine mammal observer Mark. Whilst Mark scans the surface of the water from the observation deck atop the Cacheflow, Tom uses special ‘passive acoustic monitoring’ equipment to check the depths of the north sea. Using a 100 metre cable which houses two receivers that it cast off from the side of the boat, Tom is able to trace the area for any mammals. “It listens for the vocalisations of the marine mammals and there’s a sound card which samples the sound very quickly so we can hear very high frequencies. He continues: “Porpoises vocalise at a very high frequency which is very similar to bats – about 130khz – which is way beyond our own hearing threshold. You are currently browsing the The Northants Green Party Blog blog archives for June, 2010.